I am not one to voice my opinion loudly on cake drama. I have a small group of cake friends that I chat with but I am generally not the one to get on the defensive on cake forums and cake debates. Recently something happened that struck a chord. I follow several cake decorating related facebook pages and forums. All of them talk about how they are groups where anyone can share pictures, ask questions, and learn. For the most part people do post pictures and look for advice – great places to learn and work together IF that is what is happening. But far too often the chat on these pages moves from learning and welcome advice to tearing other cake decorators and customers down. To be honest it is why I try to stay out of these pages all together. The cake world has gotten a bad rap for being a catty place to be. It is things like this that make this an unfortunate truth. The cake world can be very catty. But it doesn’t have to be. These pages have a great opportunity to be used for exactly what they were created for; to learn, encourage and build up our fellow cake decorators. Many of these pages state that they are all inclusive; any cake decorator who finds the page is welcome to join. Follow the simple rules and you’re in. They often talk about welcoming newbies. But here is where my problem lies… how can a cake page be welcoming to new or inexperienced cake decorators when the members of the page are posting screen shots of ads and pictures done by other decorators and making fun of them? In a page that has thousands of members how do you know you haven’t stumbled upon the picture or ad of someone from that very group? Not that doing this to someone outside the group means its okay but how embarrassing would it be for a brand new member to scroll through old posts to find that they have been made fun of in the past. How heartbreaking to someone who is just trying to start their cake decorating journey. People make comments about other cake decorator’s lack of skills, they make comments about their lack of advertising knowledge, and they attack anything and everything they can about these unknown cake decorators. Even to the point recently where people were calling or emailing these unknown cake decorators pretending to be potential customers inquiring about an order. deliberately hurtful in one’s remarks; spiteful. of or relating to cats; catlike. Well we know that we’re not talking about definition number two 🙂 You could say that calling people pretending to a customer is not hurtful. You could say “I didn’t say anything mean. I didn’t tell her how terrible her cakes are or how wrong she is.” But you did… you hurt her. You hurt her because you gave her that excited feeling we all got as new cake decorators starting a business and hearing our phone ring with a potential order. And then the disappointment when nothing came of that conversation where she was sweet and trying to bend over backwards for you to get a new customer – maybe for all you know you were her first potential customer (not that it matters if it’s her first or one hundred and first). Now that could happen on any given day with an actual potential customer. But you weren’t a potential customer. You were someone calling her and then reporting back to your cake page to make fun of her with your cake friends. We have all made mistakes – every single one of us, myself included. I am not immune and I am not innocent. It is very easy to get wrapped up in cake drama. Not one of us walks on cake water. No, not even that cake decorator that you hold up on a pedestal. I have my pedestal sitters – my cake idols. And even they have made mistakes. I know they have because they are human. We all learn, we all grow, and we all change and develop our cake and business knowledge. So why can we not build each other up and help each other. Instead of attacking each other why don’t we reach out and offer help and advice. Yes, some cake decorators may not want it. But then you can say to yourself “I tried. I didn’t attack. I tried my best and I offered what I could.” Some people are fearful of helping someone who might potentially be their competition. Competition is not a bad thing. Helping your competition is not a bad thing. Being friends with your competition is not a bad thing. Imagine this – you see an ad where a cake decorator in your area is offering cakes WAY cheaper then you are. You’re angry; you’re worried what they will do to your business. You have two options – run to your cake group and complain and see what you gain out of that. (I’ll give you a hint… nothing much but more pent up fuelled anger.) Or you can call up your new competition and say “can we chat about prices and work on being on the same page.” Maybe their skill level isn’t where yours is and they aren’t at a place to be charging what you’re charging. That’s fine! Experience has value and you’ve earned it. Customers will be placing orders based on what each of you can provide and has to offer. You can still offer them advice so that they are not undervaluing what they can do which is harmful to every cake decorator’s business. Or maybe you’re both at the same skill level but they’re new and trying to get their foot in the door. Having the conversation with them about keeping pricing on an even playing field will help you both. Customers will be getting similar quotes across the board and booking who they feel comfortable with. Opening the door of communication also means you’ve found someone who will very likely refer business your way that they can’t take on and vice versa. They will probably be very grateful to have an experienced cake decorator reach out to them and help them realize they shouldn’t be short changing themselves. Wow! Look at that! ; Two different ways to react one with no gain… one with quiet possibly new cake orders and maybe even a new cake friend. (And we all need those. I’ve called on many a cake friend to help with all kinds of things. And I’ve had many a cake friend call me for the same.) I think the choice there is pretty clear. We can’t all do every cake out there. When chatting with a new cake decorator and trying to get them to understand pricing I often say “Do you want to be the person who gets orders because you make cheap cake. Or do you want to be the person who gets orders because the customer wants YOUR cake”. I don’t ever want a customer to pick me because I was the cheapest. I want a customer to pick me because they felt comfortable with me – they liked my design, they liked my personality and they were excited to have me doing their cake. This is just one example of the things I have watched happen. It doesn’t stop with pricing. It carries through to attacking many other things about a cake decorator and even attack things about customers. I am all for going on boards and asking for advice about difficult customers. We’ve all had them and often times it’s hard to know how to deal with them. But there is a difference between asking for advice and outright complaining just to put it out there. Who wants that negative energy really? The point I am getting at in all of this is that there is absolutely no gain making fun of or attacking other cake decorators or your customers. People may feel these pages are private because they are closed groups. But they are open to just a few thousand cake decorators. That is not private! If you’re irritated with something discuss it with your husband, wife, cake spouse, partner, mom, dad – whoever your go to person is (provided they’re not tired of listening to cake stories). And then move on! But only get irritated about it if you can honestly say you’ve done something to try and help the situation. If at the end of the day you have done something that will help better the cake world well then pat yourself on the back and head to bed. You’ve probably got a long cake day ahead of you and don’t need to be spending your time on cake drama. Chrissie is the founder and creative director of Icing Inspirations. She has been around her passion, the art of baking & cakes, all of her life. 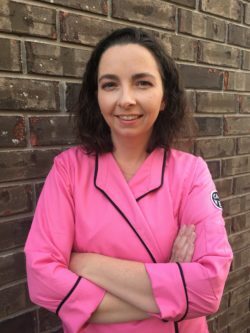 Her work has been featured in many top cake design and wedding magazines where she is a regular contributor with cake features and design tutorials.